Well, you'd think with the weather reports the way they are, I would be frantically shopping and getting ready for the hurricane of the decade. Frankenstorm and all. I'm going to have spooktacular fun crafting instead! And really, what better way to spend THIS particular day than completing the final touches of your Halloween decorations and treats! So, while I'm usually up to NO GOOD, today I'm having some good old fashioned fun making (and eating) treats so that the little tricksters out there will NOT target me on Halloween. As I mentioned a couple weeks ago, we don't get many kids on Halloween around here, so I usually put together a few unique packages filled with candy to give each little cutie that comes by all decked out in fun costumes. The above is one of those packages. And I love that it's quick AND pretty AND festive. Oh, and it fits the 3Girl Jam Challenge. 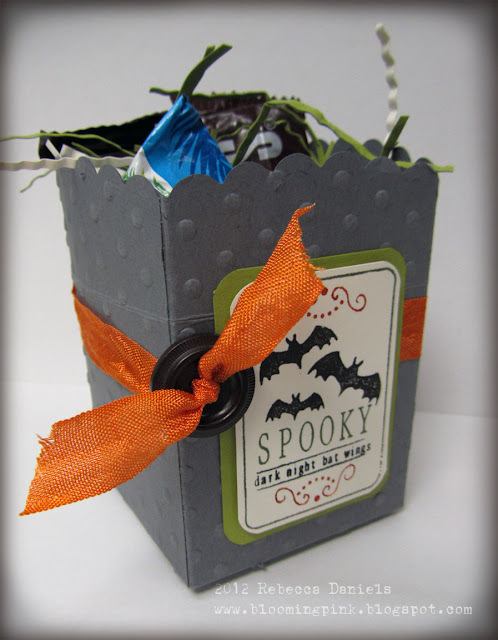 A Halloween Treat using a ribbon. If you've been making some, link yours up! They have great give-aways to the winner and a chance to be guest designer! How cool is that? With the die cutting machine, cut 4 scallop envelops. Emboss them using the folder of your choice. This next part is a little tricky. 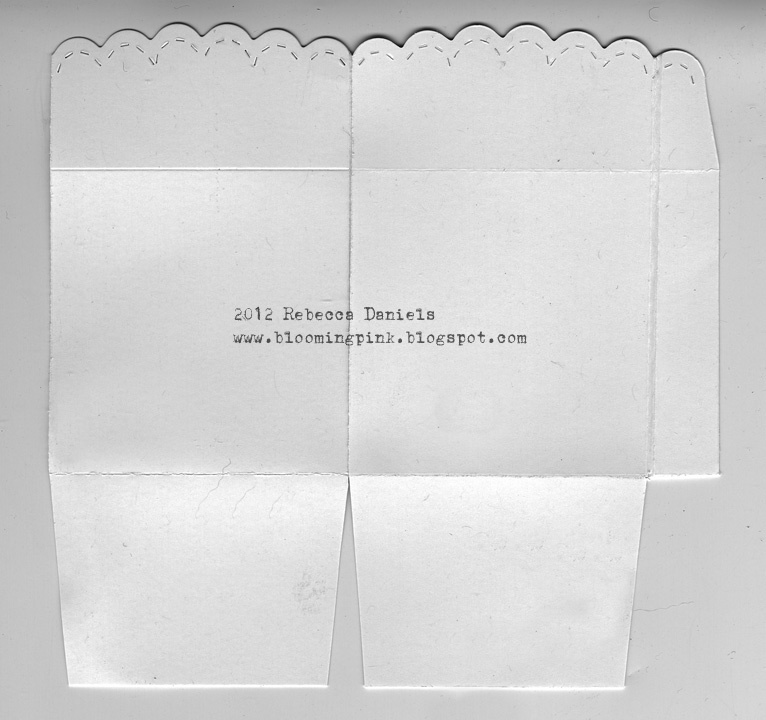 Cut and score each envelope die as indicated in the image below. 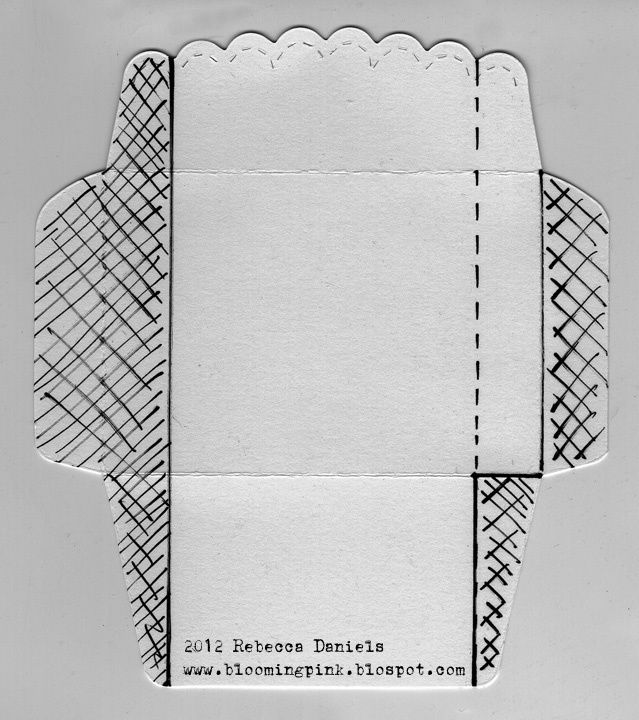 The envelope is displayed with the side you want to be on the OUTSIDE. Note that hatched areas are areas to cut away while the dashed lines are scored lines. 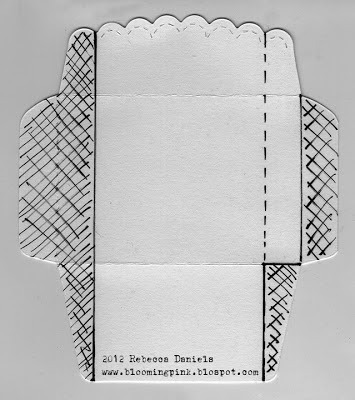 Construct the box by taking the tab you have made (on the RIGHT SIDE above) and adhere it under the LEFT SIDE of the next piece of card stock. Make sure you use a really good adhesive. For projects like this, I use a good glue like Sobo. But there are lots of great sticky tapes that will work too. Adhere in the same manner with all four pieces and the last piece is adhered to the LEFT side of the first piece you started with. Make sense? If not, see below for an image where I have adhered two sides. Tuck and glue the bottom. The box is now constructed! Yay. Now for the mo-fun part. (9) Corner punch - the one I used is from Stampin Up! Wrap your crinkle ribbon around the box. Pull the ends through your button holes and tie. Stamp your spooky image on the off-white card stock using the markers. Layer onto the ribbon, tucking slightly behind the button. Fill your box with treats and scraps. Squeal with delight as you ADMIRE your creation! So, there you have it. Just in case you needed ANOTHER reason to make something and fill it with CHOCOLATE! Now, go make something boo-tiful! What a GREAT box!!! LOVE that you shared the measurements and LOVE the embellishments!!! Great Halloween treat box! Thanks so much for participating in our Really Reasonable Ribbon Challenge. Great treat box. 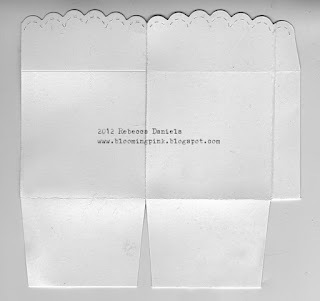 I love the added detail of the embossing and ribbon. Be safe and have a great day.